Sometimes called a dump truck, tipper trucks are a safe and efficient way of transporting loose materials. Whether you are a contractor, construction company, supplier, or farmer, a tipper truck is one of the most useful tools of the trade you can find. Many of our clients find truck rental is an affordable way to cover when one of their own vehicles is in for repair or when they need a specialised vehicle for a specific project. Talk to us if you’re site clearing, demolition or quarry work or if you’re carting grain, sand, aggregate or soil. Rentco offers very competitive rates for short or longer term tipper truck hire. A Rentco tipper truck hire vehicle is easy to maneuver and can operate in tight spaces which makes it ideal for inner city construction sites. Easy to load, this open-bed truck is hinged at the rear of the bed and fitted with hydraulic levers. The hydraulic lifter raises the front of the bed, allowing the cargo of loose material to be safely offloaded or dumped. Because safety and driver comfort is important to us, our modern fleet of rental trucks are equipped with a tandem drive axle. This technology improves handling and stability when driving at highway speeds and is less of a dramatic if you happen to puncture a tyre. Another advantage of a smoother ride includes increased driver comfort, less body stress and noise in the cab. We understand that ‘time is money’ and when you’re in business you can’t afford to waste either! 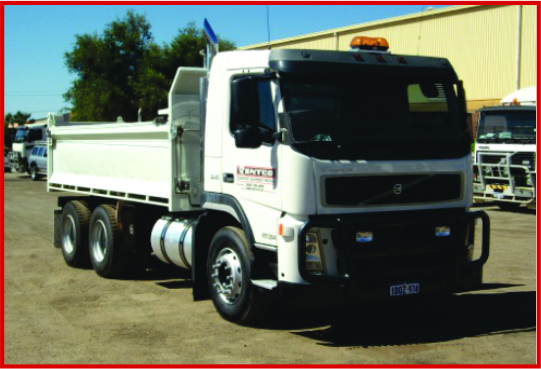 When you need a real workhorse with a generous 14 cubic metre body, hire a tipper truck from Rentco. Easy to load and offload, our tipper trucks help you to stay productive and get the job done fast and efficiently. We love the versatility of the two-way tailgate and think you will too. This smart design feature means the tailgate can be easily switched between side or top-hinged. An important safety bonus includes the ability to operate the hoist from a secure position beside the trailer, reducing the danger of human error. Road safety and load restraint is everyone's responsibility. Fly away cargo poses a real risk to other road users and can result in hefty fines or infringements. To comply with State government regulations, all Rentco tipper trucks are equipped with retractable tarps. We’ve built our business reputation on customer service, and pride ourselves on operating a fleet of modern hire vehicles that undergo a multi-point safety check before they leave our depot. We have a staff of experienced and qualified technicians who service and maintain our fleet in-house. Rentco is committed to offering value for money. We offer very competitive rates for short or longer term hire with the bonus of 24/7 national breakdown support service. With outlets in Perth, Adelaide, Melbourne, Sydney, Brisbane, Townsville and Darwin, you enjoy good old fashioned local service with the benefit of a national network.